Mercedes-Benz chose the International Defense Exhibition Eurosatory 2008 in Paris, a show we don't normally attend, to introduce their new Zetros truck. The model pictured above is the Zetros 2733 A 6x6, offering permanent all-wheel-drive to all three axles and the ability to haul nearly 10 tons of equipment and supplies. If you just don't have that much stuff, Mercedes also offers the Zetros 1833 A 4x4, a two-axle derivative with a reduced load capacity. Both versions offer go-anywhere capabilities with exemplary off-road manners and the ability to be upgraded with state-of-the art armor for protection against mine and ballistic attack. While you'd expect the Zetros to handle like a wet noodle, the German automaker insists the Zetros has been designed with the driver in mind, adding "...the ideal seating position behind the front axle delivers intuitive car-like handling." Since we don't have a Zetros planned for an "In the Autoblog Garage" review, we'll just have to take their word on that. STUTTGART/PARIS –--Daimler AG proudly presents its new off-road truck, the Mercedes-Benz Zetros, at this year's International Defence Exhibition Eurosatory 2008 in Paris from 16 to 20 June. Zetros will be offered in a three-axle cab-behind-engine truck version (Zetros 2733 A 6x6) and a two-axle version (Zetros 1833 A 4x4). The three-axle model offers payloads from 7 tonnes to 10 tonnes, while the two-axle model has payloads of 4 tonnes to 6 tonnes. The extreme off-road capability of the Zetros all-wheel-drive truck is unique in this segment, including especially its tactical and strategic mobility (air and rail transportability). The novel approach of a cab-behind-engine truck with its low design height and its centre of gravity behind the front axle provides an ideal platform for armoured versions capable of withstanding mines and ballistic attack. Where safe roads are few and far between – on disaster relief assignments or military operations, such as peacekeeping missions – the Zetros is sure to have the answer. The all-wheel-drive cab-behind-engine truck masters all missions. Demands on crew and vehicle have risen continuously over recent years. The new Mercedes-Benz Zetros follows the path of conventional-type vehicles that enjoy legendary status worldwide. It offers everything that is needed to meet today's extreme operational conditions. Its conceptual low design height makes it ideal for rail or air transport. And it gives the crew much greater feeling of safety, whatever the situation may be. Daimler's concept for its new off-road, all-wheel-drive truck series offers a number of key advantages over comparable vehicles currently available on the market. The new vehicle concept is primarily based on standard production line, all-wheel-drive components from the Axor/Actros series that have proven themselves on assignments worldwide and have been modified for off-road use, combined with an innovative cab module. This draws on the "Global Cockpit" and steering system of the MB Axor. These measures and components made it possible to transfer the generally recognised excellent ergonomic features of a logistic distribution truck to an off-road vehicle. At the same time, this make it possible to standardise the vehicle's dashboard and controls across the fleet and so significantly reduces vehicle damage caused by operating errors, while simultaneously cutting the amount of operator training needed. The new all-wheel-drive truck series stands out particularly with its high strategic and tactical mobility and its robust nature, plus the highest standards of reliability and economy expected from Mercedes-Benz. The ideal seating position behind the front axle delivers intuitive car-like handling and, together with the standard production line control elements, helps drivers master the Zetros quickly and confidently. A key factor in the training of drivers is that all the control elements are identical, no matter whether in a two-axle or three-axle truck. This contributes to the truck's operating safety. Its comfortable drive and excellent handling additionally make long assignments possible, without tiredness or loss of concentration, so drivers can fully exploit all the technical features that the Zetros has to offer. The vehicles in this series come with a standardised cab that meets the highest standards in terms of safety and ergonomic design. Besides three single seats, the cab offers ample storage space for equipment like radio communication, SatNavs, or personal belongings. The all-in-one concept (chassis, cab and vehicle bodies) meets all the requirements associated with highly-mobile, on-road and off-road vehicles. The forward tilting bonnet in this series facilitates fast and easy servicing. The cab does not need to be tilted to service the vehicle, which is technically much harder with armoured cab-over-engine trucks. This means that some of the crew can stay in the cab for communications or protection tasks. Compared with cab-over-engine versions, the lower front axle load of cab-behind-engine design opens up additional options for adding accessories to make the conventional trucks even more universal in their application. The cab-behind-engine design reduces the workload on the crew and delivers that unique feeling of safety known from the Unimogs with an concept that reduces driver fatigue and simultaneously enhances driver performance. It provides a practically ideal weight distribution with payload reserves on the front axle. The all-wheel chassis with cab-behind-engine provides a much more comfortable ride than cab-over-engine trucks, and so enhances the vehicle's operating safety. It also contributes to the truck's exceptional off-road capability, including in extreme terrain. The integrated design of the Mercedes-Benz Zetros includes a level cab floor with a comfortable seating position for the 2nd co-driver and easy through-cab access. In addition, the low cab design enables the 4x4 and 6x6 vehicles to be air-lifted in transport aircraft such as the Hercules C 130 or the Transall C 160 with a minimum of preparation. Rail transportability is also assured as the vehicle conforms with the international loading gauge. Armoured versions of the new Mercedes-Benz Zetros all-wheel-drive truck family ready to meet every contingency. On operations in crisis areas, being able to rely on the vehicle whatever the situation is key. The new Zetros meets these demands. The balanced axle load distribution of a cab-behind-engine truck guarantees safe handling regardless of load condition. The load distribution across the axles opens up opportunities for cab versions that can be upgraded to provide state-of-the-art ballistic and mine protection, enhancing crew safety, without losing the outstanding off-road driving characteristics. The low cab-behind-engine design of the new Mercedes-Benz all-wheel-drive truck series makes it easy to modify the vehicle to provide ballistic protection for personnel. Fitted as standard, the flat cab, a 7 mm-thick steel cab underfloor combined with an integrated spall liner (optional) offers the occupants sufficient protection against AP mines without overloading the front axle. Parallel to the new truck concept, an extensive ballistic protection concept has been developed. The use of identical drivetrains in the two- and three-axle trucks streamlines the supply of many identical parts for the vehicles. The Zetros Series draws on proven components and engines from the standard production line trucks built by the Mercedes-Benz Commercial Vehicles Division. 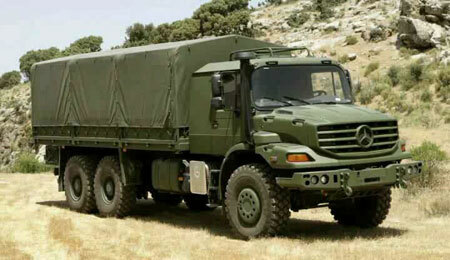 Besides engines from the 900 series (also in service in military Unimogs), gear boxes and transfer boxes from the MB Modular System, axles from the planetary hub reduction axles series 7 are also used, components that have proven themselves millions of times over, not least in the toughest of assignments all around the world. The proven drive concept offers permanent all-wheel drive and differential locks in the transfer boxes as well as in all axles that can comfortably be engaged or disengaged from the driver's seat. This means that proven planetary hub reduction axles with their ample ground clearance ensure that the truck gets through safely, whatever the terrain. For even tougher conditions, such as sand, a central tyre inflation system can be ordered as an optional extra. This specific technology – in combination with the Daimler "Star Diagnose" – makes it possible to keep operating costs down while simultaneously minimising the time spent training the maintenance staff. Like all commercial vehicles from Mercedes-Benz, Zetros builds on a concept that has been fully developed by Daimler engineers and harmonised with the vehicle's key features. The use of chassis units and engines that closely resemble their standard production-line counterparts as well as a cab with an interior also largely made up of parts from the standard production line ensures that our customers can be sure to get lifecycle support and service worldwide. We have nearly 5,000 service centres in 160 countries worldwide ready to supply replacement parts quickly, coupled with workshop support.